Designed for both Hebrew and non-Hebrew students, A Handbook to Old Testament Exegesis offers a fresh, hands-on introduction to exegesis of the Old Testament. William P. Brown begins not with the biblical text itself but with the reader, helping students to identify their own interpretive lenses before engaging the biblical text. Brown guides the student through a wide variety of interpretive approaches, including modern methodologies—feminist, womanist, Latino/a, queer, postcolonial, disability, and ecological approaches—alongside more traditional methods. This allows students to critically reflect on themselves as bona fide interpreters. While covering a wide range of biblical passages, Brown also highlights two common biblical texts throughout the work to help show how each interpretive approach highlights different dimensions of the same texts. Students will appreciate the value of an empathetic inquiry of Scripture that is both inclusive of others and textually in-depth. "In this comprehensive volume, Brown moves biblical exegesis into the twenty-first century. Brown introduces a fresh understanding of exegesis that acknowledges the multivalence of texts and supports the reader in seeking creativity, adventure, and wonder. 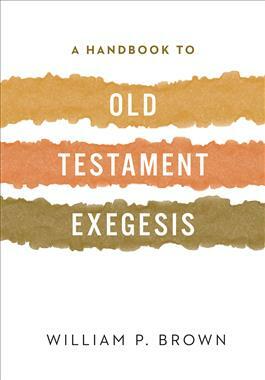 Well-researched and filled with helpful textual examples, A Handbook to Old Testament Exegesis is a welcome addition to the library of any student of biblical interpretation." "The wait is over! Bill Brown's Handbook to Old Testament Exegesis provides students a trustworthy, practical guide to the 'practiced art' of interpreting biblical texts, yet without being ponderous or cumbersome. Fresh, accessible, and graceful, the handbook walks readers through the technical aspects of exegesis as well as the larger questions of contexts and interpretive frameworks, with an eye on the pressing questions of our time. I can't wait to use it in the classroom to help students develop their own abilities to access the wondrous depths of the Bible." "We have long been in debt to William Brown's masterful works of exegesis. With his latest book, he puts us in his debt once more with a masterful work about exegesis. Brown covers everything from getting started (exegeting the self and initial impressions) to translation to textual criticism, stylistic and structural analysis, compositional and comparative approaches, and of course literary, historical, and canonical investigations. If all that wasn't enough, Brown takes us from analytical approaches to the text itself to the open table of interpretation, explaining and illustrating an impressive range of 'readings in place'—from science to theology and everything in between. Still further, Brown does not leave unmentioned the culminating act of communicating the text to others. Throughout the book he conducts a master class of his own by relating all of the approaches to Genesis 1-3. There are numerous exegetical handbooks on the market, but they can now retire happily. Brown's work sets the standard and will remain the standard for years to come. Vast in scope, hermeneutically savvy, theologically adept, ecclesially centered, artfully crafted, and beautifully written, this is the exegetical handbook we've all been waiting for." "Bill Brown brings both his vast erudition and his meticulous attentiveness to the art and craft of Bible reading. The outcome of his prodigious work is a book that has no parallel among our current resources. Brown walks us through the conventional modes of critical reading with impressive textual specificity. Beyond that he offers access to his signature scholarship concerning science, evolution, and ecology with immense learning and acute artistic sensitivity. Potential readers should not be misled by the ordinariness of the book's title. In addition to being an introduction for new students, it will be a welcome resource for those trapped in so-called 'objective' criticism and for those who have been at it so long that they think they know ahead of time what texts will say. Brown brings his own wonder and capacity for surprise that will be contagious for his readers. It may be that the book will evoke a new epidemic of excitement and engagement for Bible readers; it is in any case an enormous gift to us all!" "So many introductions to exegesis are earnest, thorough, excellent, and, . . . well, boring. In a delightful change of pace, Brown's has all those virtues, but it has the wonderful distinction of being fresh, engaging, and even fun. Brown beautifully integrates the classic concern for the discovery of the otherness of the text with exercises that help readers to discover their own situatedness in history and society. Then he guides the reader to see how reading oneself as well as reading the text can shed new light on how both can respectfully converge to illumine topics of mutual concern. This is the exegetical and hermeneutical handbook I've been waiting for. I look forward to teaching it in my courses."